Nelson Mandela was a true 20th century icon, a former prison inmate from humble beginnings who emerged to lead the African National Congress political party to victory in the nation’s first truly democratic election in 1994. In the process he showed mercy and magnanimity toward the country’s racist former rulers, despite the fact that they condemned him to spend nearly three decades in prison. On the sad occasion of Nelson Mandela’s passing, Legacy Magazines celebrates the amazing, inspirational life of the Nobel Peace Prize winner, detailing his early encounters with the evils of apartheid and the many trials he had to endure before emerging triumphant. 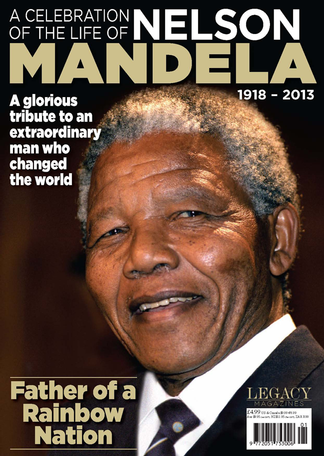 Packed with fascinating text and rare and exclusive photographs, this high quality magazine special will become a collector’s item in years to come and serves as a fitting tribute to a man who really did change the world. Be the first person to tell us what you think about A Celebration of the Life of Nelson Mandela and you'll save £2.50 on your next purchase!